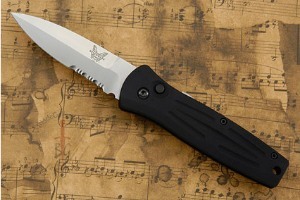 Description: If you're looking for an auto-open folder with low-profile that readily delivers the edge when you need it, the Benchmade 3550S Auto is a great choice. 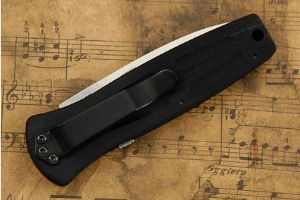 This efficient Mel Pardue design, with its spear-point satin finished 154CM stainless steel blade and slimmed down lines, works well as a boot knife or for convenient concealed carry with the use of the steel carry-clip. 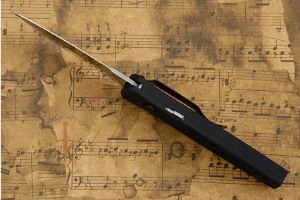 The black anodized T-6 machined aluminum handles are comfortable and thin. The 3350S also has sliding safety that works without a hitch. A great knife for every day use or for a collection. 0.04736328125 0.04736328125 47.36328125 47.36328125 Header Started. 0.15625 0.03125 156.25 31.25 Trailer Started. 0.31201171875 0.15576171875 312.01171875 155.76171875 Trailer Completed.